Vehicles ads in Bathurst. Thank you for visiting our free advertising website Vehicles, Bathurst section. We provide high response free classifieds and free advertisement. Use our online free Vehicles classifieds placement system to find, list, offer Vehicles online! Holden Monaro CV8 in outstanding condition with just 99, 000kms. Will not disappoint! This is a sensational car to drive and has been meticulously cared for over the last 12 years. The Monaro is factory standard unmodified having had no one fiddle with mods or add ons. The 5.7 litre V8 engine produces 245kW of power. Dynamic, reaching speeds of 100km/h in 5.2 seconds!. 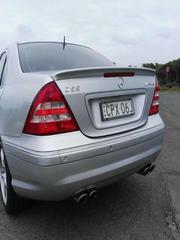 This 2005 Mercedes-Benz C55 is built with a 5.4 litre engine and 270kW of power!. Protect yourself with these features: - Brake assist - Side airbags - Driver airbag - Passenger airbag MORE FEATURES: This car has power steering, cruise control, leather gear knob, remote central locking, 18" alloy wheels, sports instruments and premium sound system. This Mercedes-Benz CLK320 Elegance is in beautiful condition, drives like a dream. Features a powerful 3.2 litre engine, equipped with ABS brakes. This car has the designer finish you require. Driver & passenger airbags, automatic headlamps, remote central locking, front fog lamps and 16" alloy wheels, brake assist, multi-function steering wheel, cruise control, power windows and satellite navigation (GPS), multi zone climate control air conditioning, 6 airbags to give you added safety and electronic stability control (ESC). Well-loved MINI, new tires, full service history and always kept garaged. Great drive! This sporty little Sky Blue Mini Cooper S looking for a new home. In great condition, awesome to drive and a joy to have. A great weekend car or sporty city drive. * 4x brand new 16" run-flat tires worth $2, 000 * major service recently done * full service history * brand new major MINI parts worth $4, 000 - replaced electronic steering pump - replaced thermal fan assembly * sun-roof and moon-roof * low kms * well-maintained and in original condition * parked undercover in garage * extra set of original matching floormats in blue RWC included in sale. Selling as it is not being drove around much anymore and too many cars at home. $15, 500 ONO Installed OEM 2006 back lights Installed DVD stereo screen with Aux + USB + Reversing Camera Professionally shiny black wrap on roof and front mid bumper Side mirrors gloss black professionally painted. It has suspension active so it's great for off road travelling. This car has power door mirrors, 17" alloy wheels, air conditioning, cruise control and remote central locking. This Toyota Landcruiser Prado GXL has driver & passenger airbags. 2 airbags to protect you and your family. Fog lights. It has 4 pot front brake calipers. V8 petrol/ LPG cruiser in very good condition. This 2003 cruiser has only 156000km on the clock and surprisingly economic considering the power of the motor. It was used for mainly highway driving . . Also comes with reverse camera/ i pod phone head unit for safety as in photos. Rear wheel carrier and roof racks. HIGH PERFORMANCE - HARROP H122 SUPER CHARGER -CAMMED - 336RWKW 650NM OVER $18, 000 performance upgrade work done in 2009 This vehicle is in perfect as new condition - Purchased brand new in Feb 2003 - 1 owner and used as a treasured commute from Castle Hill to South Coast on weekends. Comes with the following performance extras installed in middle July 2009 by Castle Hill Exhaust. Optima Yellow battery (3rd battery for auxillary power) - onboard ARB air compressor located in engine bay - ARB 2.5mtr x 2mtr roll out awning - Rhino roof bars (3 rails) - Alloy roof cage - Narva Ulitma 225 driving lights - 12v & usb charge points throughout the car - Tekonsha Prodigy Electric Brake. Leather steering wheel - Premium sound system - Cruise control - Multi-function control screen - Front & rear power windows - 18" alloy wheels - Roof rails - Remote central locking - Sports pedals - GPS navigation system - Rain sensor wipers - Heated rear seats Recently serviced and 4 new tyres by Chellingworth Porche. Track Model - Excellent condition, Road Worthy Certificate (RWC) will be included, and always service with Nissan. This car has been well looked after, looks new inside and outside. It is exclusively used for weekends only.. This ute has given me outstanding service and it is with regret that I have to sell it. It has done very little hard work ( towing a horse float) and very little off road (Mainly in the paddocks) It also has twin batteries that allowed me to run a large Waco fridge 24/7 in the rear . Also fitted is an electronic braking system for Vans, Floats or heavy trailers . Snorkel - Limited slip diff (LSD) - Power steering - Side steps - Reverse camera - 2 custom bucket seats - Diff breathers - 2 x batteries - Engel remote control fridge - Cook-top built in gas - Sink -Double bed up top - Custom camouflage paint - Internal LED lights - 15 amp outlet for caravan park - Fire extinguisher - Wired for 240 volt with battery charger (has 240 and 12 volt outlets) - Rear and side awnings - Rear camera with dashboard screen . This car turns heads wherever you take it. We have loved every moment of owning the Porsche over the last 3 years, but now sadly itâ€™s time to say goodbye as itâ€™s time to start a family. Full service history available, every single receipt has been kept and this car has been meticulously maintained and serviced every 10, 000km's (more than Porsche suggests) by a Brisbane exotics car specialist. 2000 Nissan Patrol ST GU II Auto 4cyl 4x4 Diesel. Absolutely spotless 7 seater, electric brakes, icey cold air conditioning, tinted windows, bullbar with bonus UHF Radio, towbar, elect windows, strictly no Beach work. BF Goodrich tyres with plenty of tread This 4x4 has sports instruments, driver airbag, and will come with a roadworthy certificate. Chev BelAir 1960 Model Factory RHD, strong 283 V8 Auto, Disc Brakes, Great Car throughout, Drive anywhere, . Four door pillarless hardtop 57 Chev. Comes with plates. Great car, came over from States with full restoration. Left hand drive.Registration has been paid until September 2017. 350 Chev, 700R transmission, powersteering, aircon, have an original front bench seat to go with it, rust free. Matching red and white 10foot caravan available if interested. REAL "M"; not one of those BMW's with an "m" pack - this is the actual "M" series. POWERFUL, ECONOMICAL and complete STYLE are the best words to describe this amazing motor vehicle. This is the ONLY DIESEL "M" in the BMW range. Not 1, Not 2, BUT "3" turbos that launch this diesel motor to life. Panoramic sunroof Full BMW service records GPS Navigation Reverse camera 2 Keys 19 Inch motorsport wheels Colour coded body styling Keyless go Bluetooth phone connectivity Bluetooth audio. FAMILY CAR (OWNED SINCE NEW). FULL NISSAN SERVICE HISTORY (ON TIME EVERY TIME). NEVER BEEN USED TO 4X4. NEVER DONE ANY BEACH WORK. ONLY EVER TOWED A SMALL CAMP TRAILER HALF DOZEN TIMES. EXCELLENT CONDITION. BEST PRICED PATROL.. I am selling due to a family expansion and an upgrade to a more seat capacity car. 77000 km on the clock only. My 2012 BMW 320d has legendary fuel economy 5.3L per 100km. It is in great A1 condition. Full service logbooks. Just completed a major service. Stay safe with these features: - Rear parking sensors - Driver airbag - Brake assist - ABS brakes - Side airbags - Passenger airbag SPECIAL FEATURES: It has climate control air conditioning. X4 EXCELLENT "CONTINENTAL" TYRES WRAPPED AROUND 17" ALLOYS * S.A OWNED WITH COMPLETE "HOLDEN" SERVICE HISTORY TO BACK IT UP * PARTIAL LEATHER INTERIOR * REVERSE SENSORS * TOWBAR * X6 SRS AIRBAGS. WANT TO BE THE ENVY OF OF EVERYONE? THIS VE SSV SHOUTS LOOK AT ME! RARE YELLOW PAINT WITH HAVE YOU TURNING HEADS EVERYWHERE AND 6LT MANUAL V8 WITH BE ALL THE PERFORMANCE YOU NEED.. This is THE COMBINATION - Black leather trim with GTI red stitching, upgraded Detroit alloy wheels, electronic sunroof for summer fun and starry nights! Go ahead and spoil yourself with what we are sure is the best presented, best looking and best featured Golf GTI on the market. It is a one owner with a full log booked service history and even comes with the genuine floormats! This powerhouse GTI hatch with versatile and very fun DSG automatic transmission is a blast to drive and will have you smiling every time you sit behind the red stiched sports steering wheel (same as in the Audi RS4) and in the black leather and red stitched sports seats. ** MUST SELL THIS CAR THIS WEEK** REDUCED FOR QUICK SALE This Luxury branded 2011 Land Rover Range Rover Sport has eye catching looks which makes it stand out from its competition. 53850 km on the clock only. SAFETY FEATURES: - Front parking sensors - Side airbags - Rear parking sensors - Passenger airbag - Reverse camera - Driver airbag - Rollover stability control - Brake assist - Trailer sway control EXCITING FEATURES It has voice recognition, leather gear knob and hill holder. Top of the range S Line. Immaculate condition, 1 owner, panoramic roof, almost new tyres, full service history, recently serviced. Only travelled 72, 280 km. This Audi Q7 2011 has a powerful 4.1 litre engine. This car will ensure your journey is taken in style. This car has 8 airbags fitted for your protection. Australia free ads for Vehicles, Bathurst, Vehicles free ads Bathurst, Vehicles for sale Bathurst, Vehicles to buy in Bathurst. Find on this page free classifieds for Vehicles in Bathurst. This listing includes classifieds for sale and to buy in Bathurst. FREEADSAustralia Bathurst offers you a platform to post free advertisements or classifieds for Vehicles in Bathurst. FREEADSAustralia helps you search, find buy, sell, rent or hire in various categories like apartments, goods for sale, local services, cars , jobs and many more in Bathurst. If you posted an advertisement in category Vehicles of FREEADSAustralia Bathurst before please use Edit my ads button to change or cancel your ad. Vehicles Bathurst ads Bathurst, Vehicles classifieds Bathurst, Vehicles free ads Bathurst, ads for sale Bathurst, ads to buy Bathurst, FREEADSAustralia. Find here ads for sale, to buy and rent in Bathurst. Goods for sale in Bathurst, vehicles for sale in Bathurst, Bathurst real estate for sale, Bathurst property for sale, property for rent in Bathurst, business ads in Bathurst, Bathurst business classifieds, services in Bathurst, Bathurst services ads, jobs in Bathurst, pets for sale in Bathurst, Bathurst dating, Bathurst cars for sale.